Among all of Raphael's great works, his Madonna of the Goldfinch has a strong personal resonance. The wonderfully rich story of its creation, destruction and restoration is representative of all that is possible when talented individuals are dedicated to creating and maintaining an object of great beauty and cultural value. This was a common theme in Renaissance art and liberties were frequently taken in mode of depiction when compared to the textual source, which states the encounter took place in the desert, and not in a meadow or garden. As a result, the vegetation rendered in such scenes instead embody symbolic attributes of the figures. This representation thus differs from the picture type known as the hortus conclusus (enclosed garden), which shows the Virgin in defined space filled with symbolic plants and animals. For aesthetic and allegorical purposes such depictions were essentially hybrids of pre-existing forms, their fusion bringing a sense of thematic and visual unity. The painting includes some standard and others that are less common to figure groups of the Holy Family or the Madonna and Child with saints. The Virgin is seated on a rock and in bare feet, in adherence to the theme described as the Madonna Humilitas or Madonna of Humility - a departure from depictions of the Madonna on a throne, as often seen in altarpiece panels. The Virgin holds a book in one hand off to her side, but does not glance at it directly. The focal point of the composition is the European Goldfinch, a bird symbolically linked to the Passion owing to the fact that it feeds while perched on thorns. Raphael's first (surviving) depiction of a European Goldfinch is in the work now known as the Solly Madonna, completed in Raphael's Umbrian phase. A key difference in the depiction of the bird is noted between these two pictures. 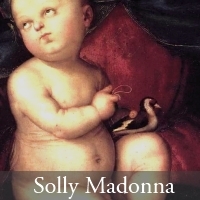 The Solly Madonna (Gemäldegalerie, Berlin) shows the infant Christ with a loop of string, in order to harness the bird, signifying his ultimate triumph over the events related in the Passion. 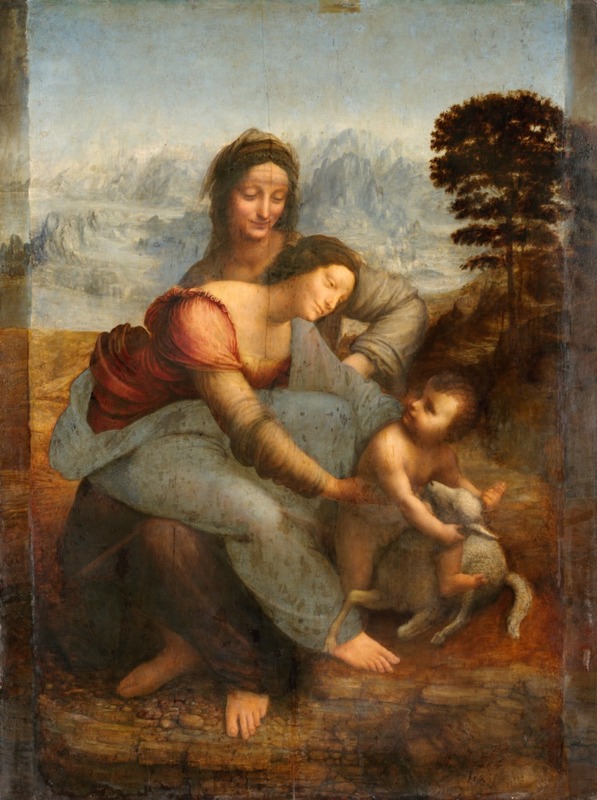 A possible source related to the depiction of the bird in the Madonna of the Goldfinch may come from Leonardo although the extent to which Raphael was familiar with Leonardo's work, and his writings is unknown from documentary sources. The most tangible evidence of this influence comes from Raphael's paintings and drawings, particularly in regard to his figure compositions. Less often noted in discussions of this painting is the arched bridge at the left hand side of the composition. 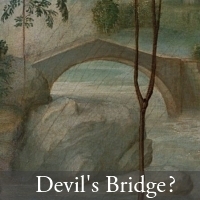 Across Europe, “Devil's Bridges” figure in folk tales and popular legends, representing triumph over the devil (see Ashliman). In Italy, these bridges are generally called Ponti del Diavolo, and there are various medieval examples throughout the country. In the literature regarding the Madonna of the Goldfinch (and Renaissance art in general) this bridge iconography has been little explored. Bridges have also been noted in depictions of Holy journeys, such as Albrecht Dürer engravings of The Vision of Saint Eustace (c.1501-2) and The Flight into Egypt (c.1504). Although there is likely to have been a specific source for Raphael's bridge in the Madonna of the Goldfinch, it remains to be identified conclusively. Plants with symbolic meanings often appear in depictions of the Holy family. 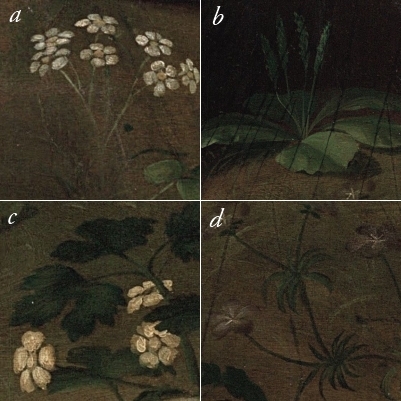 Four tentatively identifiable plants are shown below, with traditions of meaning in Christian art and particular reference to the Madonna and Christ child. (Levi d'Ancona, Ferguson). Daisies represented the innocence of the Christ child, anemones denoted the sorrow of the Virgin for the Passion. Plaintains are cited as a symbol of the path of the multitude following Christ. Violets were a symbol of humility describing the Virgin and the Christ child, the latter being linked to descriptions by Adam of Perseigne and Saint Bernard. The figure of the infant Saint John is instantly recognisable due to his attire. Depictions of desert hermits were commonly shown to be wearing animal skins. Description of Saint John in the wilderness mention him "living on wild honey and locusts and wearing a garment of camel hair with a leather girdle" (Murray). The bowl hanging from the young saint's waist is a direct foreshadowing of a later event, the baptism of Christ - images of which often include Saint John with a simple bowl befitting a desert hermit. The depiction of the landscape divided between natural features and a stylised buildings can be attributed to the northern influence which became increasingly popular in early 16th century depictions. The building in the background has not been conclusively identified as a reference to any actual structures, but could be interpreted as stylised image of a town and a church. 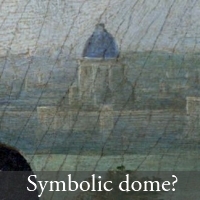 The blue dome in particular could be a reference to the Eastern Church or the Holy Land. 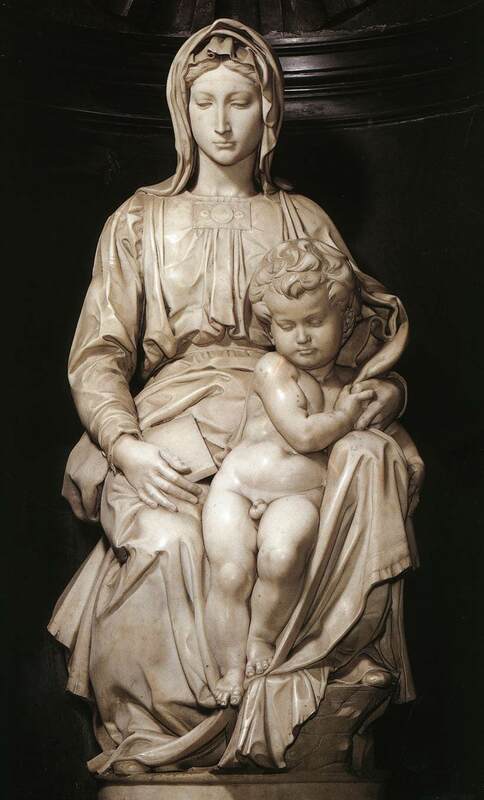 Along with the Madonna of the Meadow and La Belle Jardinière, this piece is emblematic of the strong Florentine influence on Raphael's style. The pyramidal arrangements of figures is ascribed to Raphael's exposure to Leonardo. 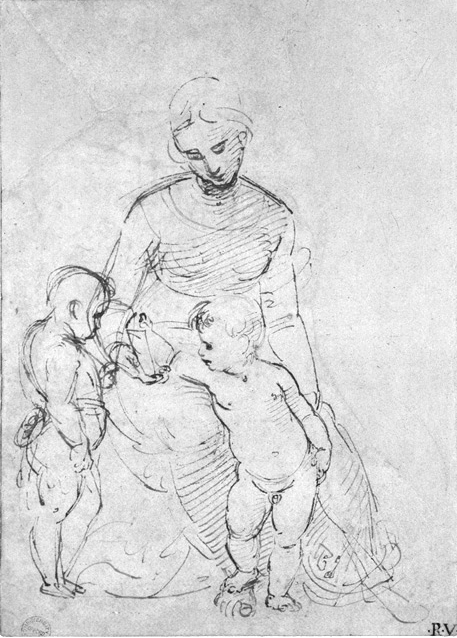 The position of the Christ child between the Virgin's knees is commonly attributed to the influence of Michelangelo's Bruges Madonna and Child. 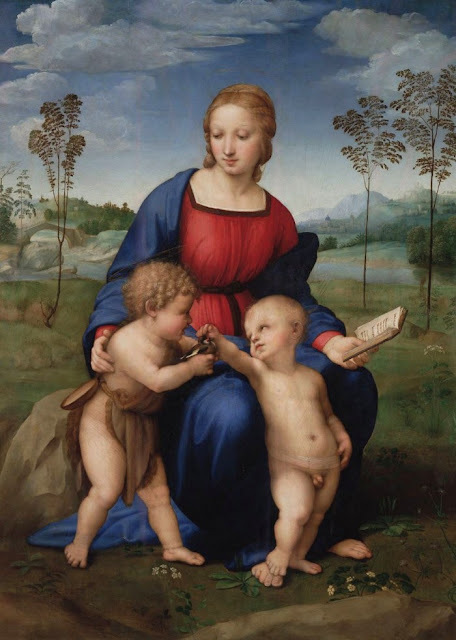 The depiction of the background hearkens to Raphael's Umbrian phase and inspiration from Northern sources where such features were commonly depicted. 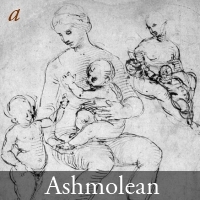 Vasari's account of this particular work is refreshingly detailed, providing both a description of the patron, the work itself as well as an account of the calamity that befell the panel during Vasari's own lifetime. The 1506 date for this work not only fits Raphael's stylistic progression at this stage during his Florentine exposure, but also is suggested as a possible wedding portrait for Lorenzo Nasi's marriage to Sandra di Matteo Canigiani. On Saturday 12 November 1547 (Julian calendar date), a landslide originating in the Monte di San Giorgio resulted in the destruction of a group of homes in the area, including the house of Lorenzo Nasi. In references consulted for this entry, a great variation in the date of this landslide is noted. The 1550 edition of Vasari states August 9 1547, which was later corrected to November 17 1547 in the second edition of the Lives. In 1897, Milanesi adds a corrective footnote citing the actual date of the landslide being 12 November 1547. A seventeenth century account of the landslide by Manni describes primary sources relating the incident, including the damage to the nearby Church of Santa Lucia and a citation referencing a first hand description of the destruction,. This source also confirms the date of the landslide as 12 November, 1547. In 1556 Cosimo I de' Medici banned further construction on the site on account of it's instability. 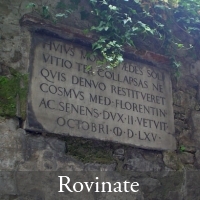 To this day the area is called the rovinate (ruins), a plaque announcing Cosimo's decree is still visible. 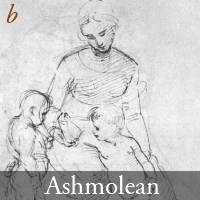 Two compositional studies for this piece survive, in the collection of Raphael drawings at the Ashmolean at Oxford University. Pen and brown ink on off-white paper. Sheet: 248 x 204 mm. The Christ child starts initially on the Virgin's lap, with the tilt of her head also more directly to the infant Saint John. On the same sheet, this was revised to place the Christ child between the Virgin's knees, whilst still maintain the tilt of the head. Pen and brown ink on white paper. Sheet: 230 x 163 mm. In this compositional study, the Virgin's gaze has now shifted towards the Christ child, whose posture now begins to more closely resemble the reaching movement seen in the final composition. 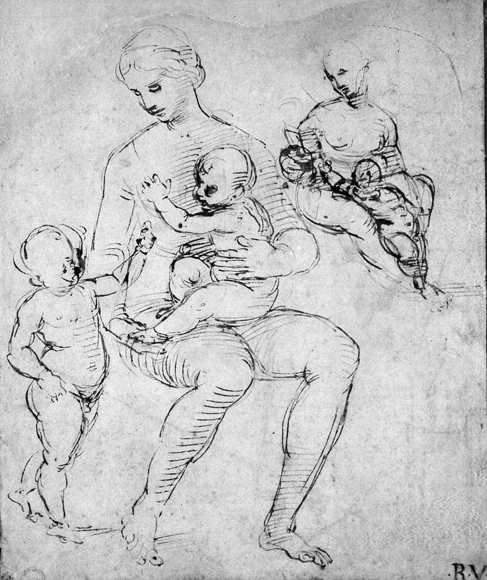 The figure of the infant Saint John is still being developed in these drawings. In addition, the Goldfinch is not directly suggested in either surviving study - and in this instance, the Virgin is showing the Christ child a book. There is also an indication of the baptismal bowl hanging from young Saint John's waist. The first restoration occurred following extensive damage to the painting following the 1547 landslide. This sixteenth century restoration has been attributed to Michele di Ridolfo Ghirlandaio, although the documentary basis of this claim has been difficult to verify beyond a claim by Gamba in 1949, and later repeated in a footnote in the 1991 Italian publication of the 1550 edition of Vasari's Lives. Other documented restorations are noted in 1804 (conducted by Sampieri) and 1821 (by del Podesta), 1843, 1947 and 1984. X-radiographs were taken to reveal the extent of fractures and repars to the panel. Images taken in raking light were made to reveal surface irregularities on the panel. Digital infrared reflectography allowed examination of preliminary drawing and subsequent layers - these images showed part of the image had been transferred via a cartoon, due to presence of pounce marks. Other additions were made in freehand using a brush. False colour infrared images allowed differentiation between original paint layer and retouches. UV Fluorescence examination allowed the thinning of old varnish layers to be tracked as cleaning progressed. X-ray fluorescence allowed analysis of pigments types applied in various stages of the painting's life, via sample of 149 measures. 3-dimensional modelling and surface topography techniques provided vital data on the nature of the panel and painted surface which compared with other images provided a more detailed 3-dimensional overview of problematic areas. Chemical and cross-sectional analyses were applied to samples taken in the 1984 restoration. Below is a 2008 Reuters news summary of the restoration at its completion, including comments by Patrizia Riitano and Marco Ciatti. In 2010, a high resolution image of the fully restored piece was added to the Google Art Project. Ciatti, M. Riitano, P. Raphael's Madonna del Cardellino: The Conservation Project in Raphael's Painting Technique: Working Practises Before Rome. Proceedings of the Eu-ARTECH workshop. Nardini Editore. 2007. pp.25-33. 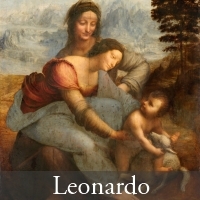 Da Vinci, L. (Trans. Richter, JP). The Literary works of Leonardo da Vinci. 1883. Samson Low, Marston, Searle and Livingston. 1883. Vol. 2. p.315. link This version is recommended as it provides transcription of Italian beside the translation and is in the public domain. Full text via archive.org. Gamba, C. Pittura umbra del Rinascimento: Raffaello. Novara, 1949. Levi D'Ancona, M. The Garden of the Renaissance: Botanical Symbolism in Italian Painting. Florence: L. S. Olschki, 1977. Many thanks to Dr. Edward Goldberg for his assistance with sources in Italian, and Terrence Lockyer for providing the translation of the rovinate inscription. That's a tremendously interesting article; thanks for posting it. Your detail in research, and ambition to tie all the available opinions and information together in one place, are delightful, so we're grateful for you sharing it. If you'll forgive my pedantry, I have noticed a few typographical errors: a rogue apostrophe in "its" in the thrid paragraph of the Nasi House section; a repacement of "dead" for "head" in the a) paragraph of the preparatory drawings section; a misspelling of "excerpted" in the Kemp reference of the bibliography. Thanks again for your efforts. I have learned so much more about art history, interpretation and appreciation from reading your articles. Welcome back and thanks for this very comprehensive post. I would just like to offer a comment on the bridge in the background. I don't think there is anything in the legend of the return from Egypt that would indicate a Satan's bridge. I would think that Raphael used the bridge to indicate a separation as well as a connection between two places (Judea and Egypt) in the same way that Giorgione used a bridge in the Tempest. NB Please excuse the typos in my own reference to your typos. What a ridiculously inevitable irony. Pot calling the kettle black etc etc. Sorry! 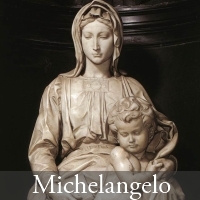 What a treat for us to have such a detailed case study of this particular Raphael, its great significance to the author evident in every syllable! Thanks for this H, I can imagine returing to Florence last year would have been extra special for you, revisiting this brilliantly restored piece. @Robert - I am pleased you enjoyed the article. I appreciate you taking the time to point out the typos, though would prefer you sent a private communication as these comments should focus on the post content! @Frank - I was not inferring that the aprocryphal story contains a "devil's bridge" - the shapes of bridges depicted in such images varies... but Raphael has distinctively chosen a medieval arch bridge here, and I wanted to indicate that such bridges had their own meaning, which do have parallels with the theme of an image foreshadowing The Passion/Resurrection - particularly those including the Goldfinch. Stephanie - Thank you again for your most wonderful comment! it was indeed a treat to see this work again last year, this piece has a very special place in my heart, and I am pleased to see it is now afforded central place in the Uffizi's new Raphael room (sala 66). Yay! A post at 3PP! Great case study, Hasan. I always enjoy when you delve into a little iconography. I didn't know that the goldfinch was associated with the Passion due to its association with thorns. So many paintings of the Christ and/or St. John the Baptist will be much more meaningful to me, now! Cheers M! Other legends associate the red that can be seen on the head of the European Goldfinch as a drop of Christ's blood. For a thorough study of Goldfinch iconography, it is worth tracking down the elusive Friedman volume. Apart from the symbology... it moves me! as a mother it is about character. The one learning and staying by his mothers side, the other running back excited with the goldfinch he has found.